Extreme freeze-thaw action occurs on the Qinghai-Tibet Plateau due to its unique climate resulting from high elevation and cold temperature. This action causes damage to the surface soil structure, as soil erosion in the Qinghai-Tibet Plateau is dominated by freeze-thaw erosion. 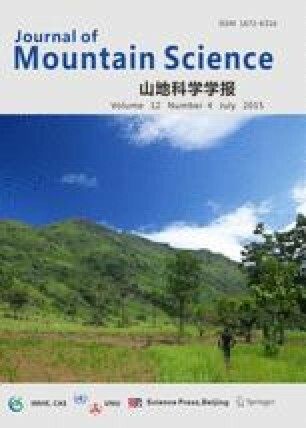 In this research, freezing-thawing process of the soil samples collected from the Qinghai-Tibet Plateau was carried out by laboratory experiments to determinate the volume variation of soil as well as physical and mechanical properties, such as porosity, granularity and uniaxial compressive strength, after the soil experiences various freeze-thaw cycles. Results show that cohesion and uniaxial compressive strength decreased as the volume and porosity of the soil increased after experiencing various freeze-thaw cycles, especially in the first six freeze-thaw cycles. Consequently, the physical and mechanical properties of the soil were altered. However, granularity and internal friction angle did not vary significantly with an increase in the freeze-thaw cycle. The structural damage among soil particles due to frozen water expansion was the major cause of changes in soil mechanical behavior in the Qinghai-Tibet Plateau.